PuzzleMad: This Unicorn is Real and I'm Not Crazy! After just one corner turn followed by a top face turn! The lurgy has continued in both me and Mrs S (who is making some rather interesting gurgling/coughing noises) and has not helped my puzzle solving abilities much and has not helped her mood at all. She was seriously unimpressed at the abrupt expansion of my collection recently. Luckily she is too incapacitated to commit violence upon my person! Hopefully, our health will improve soon or I will be murdered in my bed and I hope that I will actually be in a position to solve something before I run out of puzzles to write about! 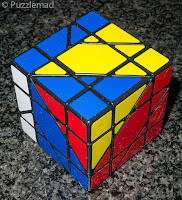 I have previously discussed the Unicorn cube - a fabulous cube that I initially found rather tough until I found my Aha! moment and understood that it could be solved by simple reduction techniques. 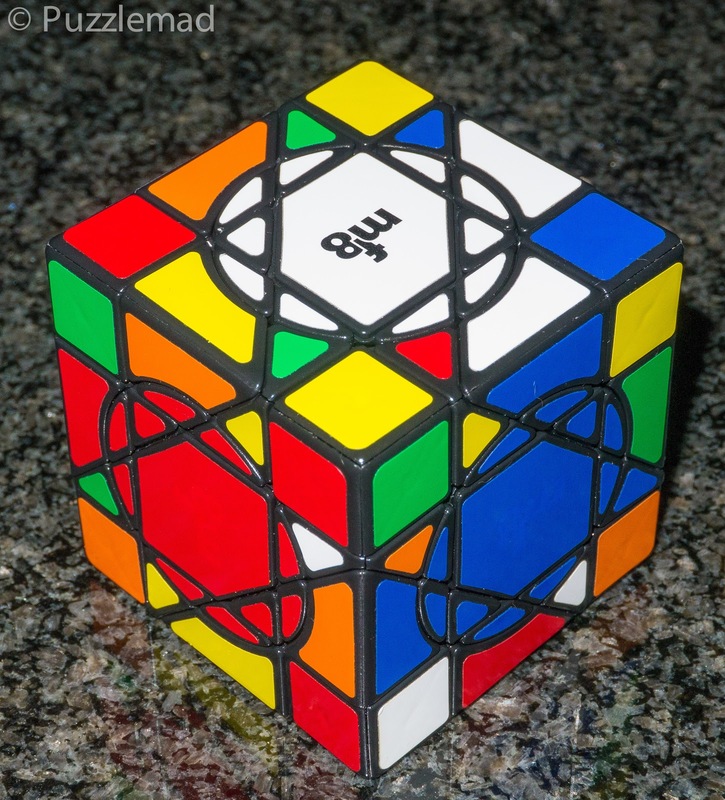 It consists of a simple 3x3 Rubik cube with 4 deeply cut corners that can be twisted too which splits the edges in two and also cuts pieces off the centres. In the end, I found that it needed little more than intuition and simple 3x3 methods making it a rather wonderful puzzle for anyone who wants a challenge just one step up (OK maybe a BIG step) from a simple 3x3. At the same time, MF8 released a crazy version of the Unicorn puzzle which of course, I had to purchase (my arm was twisted) but I never expected to be able to solve it. In fact, when I took the top 2 photos, it scared me enough that I didn't pick the puzzle up for another 2 months after that! Eventually, an FB friend showed off his ability to solve the puzzle and encouraged me to give it a try. he said that I would be pleasantly surprised by it. GULP! Luckily it is quite lovely scrambled - there is a high chance it would remain this way! 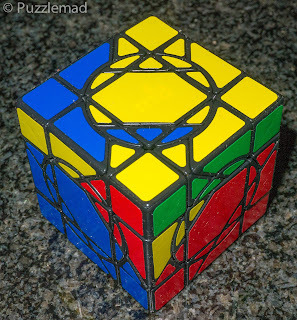 I threw caution to the wind and scrambled it using a similar process to the ordinary Unicorn cube. It ended up looking fairly horrific and I was fairly certain that it would stay that way forever. 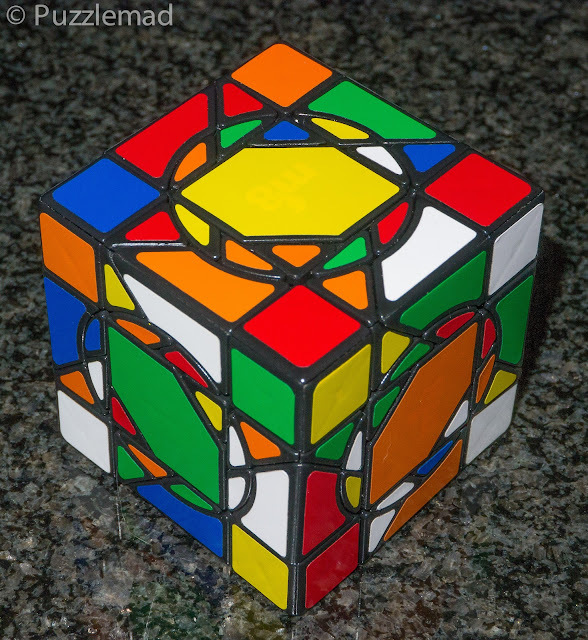 The first thing I realised was that this puzzle was going to have to be solved differently to the plain Unicorn cube. There would be similarities but much of it would be different. The circles are fixed and do not turn with the outer parts hence making this a full "circle cube" and not really one of the Crazy planet cubes that I extolled the virtues of many years ago. The Crazy planet cubes have various combinations where the centres do or don't turn with the outer parts making for a very challenging series (which I really should go back to). I am told that a circle cube, where all the centres are fixed, is actually a simple puzzle in its solution process. I was delighted to see that these were not going to be a crazy series although it would appear that there is a simple piece inside that can be flipped over to change the way each face functions and I guess that it will not be long before the twisty crackpots begin to turn this into a planet series too. My first step was very similar to the plain Unicorn cube. I needed to realign the faces to allow the corners to turn again. As you can see above, the use of 90º turns at the end of the scramble causes the corners to be blocked from further rotation. Unblocking the corners is mostly just intuition and judicial use of the 4 move edge piece series to ensure the edges are positioned and oriented correctly. After that, it may be that something else is obvious? 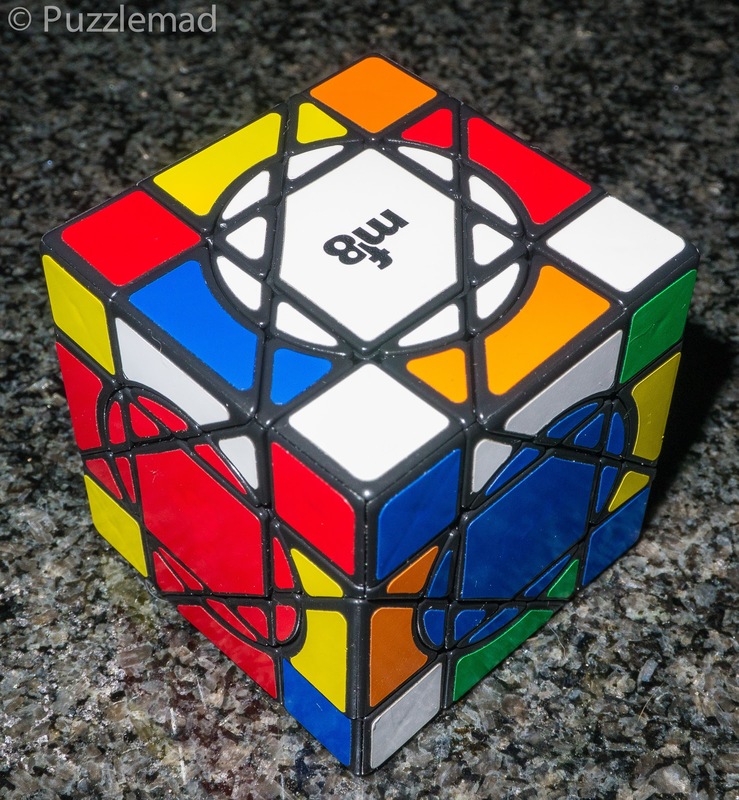 I suspect that it's hard to say that from the photo but when playing with the cube it is fairly obvious that the circle edges that are not part of the turnable corner can only be on that face. There is actually no physical way to move them anywhere off the face and it is then fairly trivial to move them. A few 180º rotations od the faces left me filled with confidence! So far the puzzle was being solved mostly by intuition and a bit of trial and error. I am not sure why I chose this order to approach the puzzle but it just seemed the right thing to do at the time. At this point, I had the squares complete and the circle edges on the non-turning corners in place with minimal effort. Now it was going to get a bit tougher! So far, not too hard! 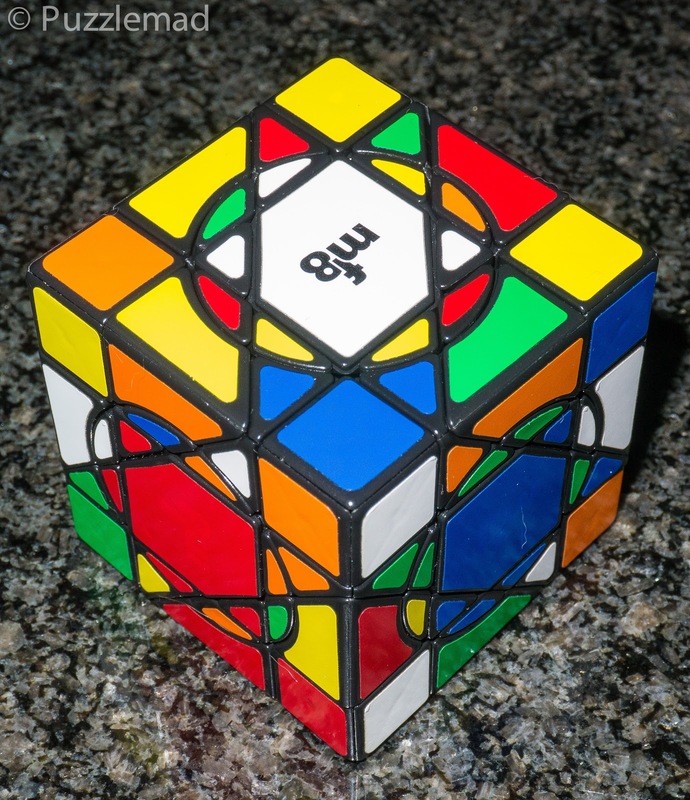 It still looks fairly fearsome to someone not familiar with Rubik type puzzles but this simply solves like a standard Rubik cube as long as you stick to algorithms that use paired movements. 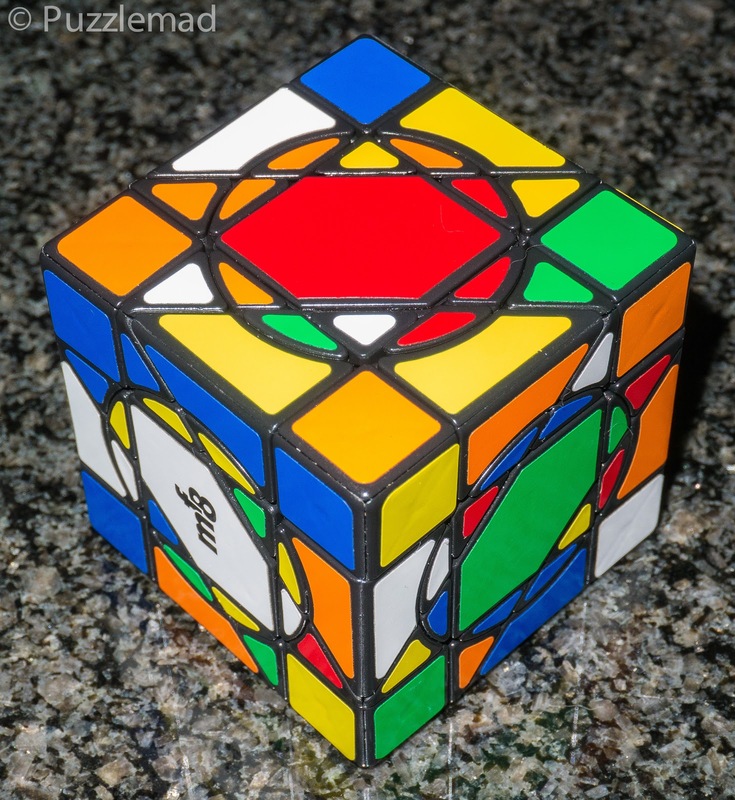 Taking advantage of Marshall's "Ultimate solution" which uses nothing more than the now infamous edge piece series and the corner piece series, it is a simple thing to solve this puzzle without ruining the centres. In fact, this puzzle is almost easier than the plain Unicorn cube! The pathway to completing the circles ensures that none of the parities that I saw in the plain version appear in the crazy version. 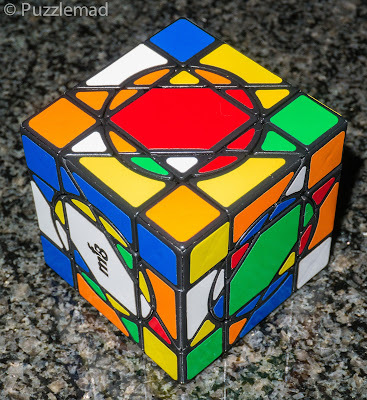 I would again say that if you can solve a 3x3 and want a little extra challenge then the Unicorn cubes (both of them) are a really good path to take. 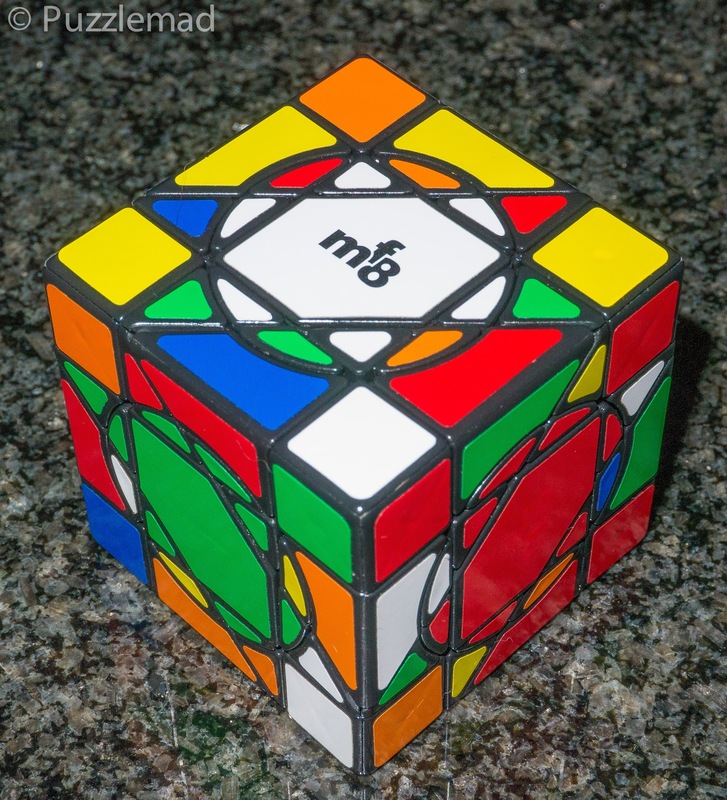 They look great, they frighten your friends and family and solve with only a little extra from what you can do already. Go buy them at HKNowstore or at PuzzleMaster whilst they are still in stock. You won't regret it! Great to see you solved it! Indeed a bit easier than it appears at first. 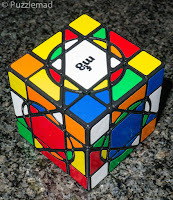 Just realized because of your post that I once saw an advertisement of these two unicorn cubes which seemed to hint on the possibility of swapping centers, effectively giving a full planetary series of unicorns. Hmmm, need to try that... If possible, that may bring about a few unicorns from hell. Just tried this... indeed a little piece inside for each of the crazy centers. Once flipped it makes a center rotate with its face. 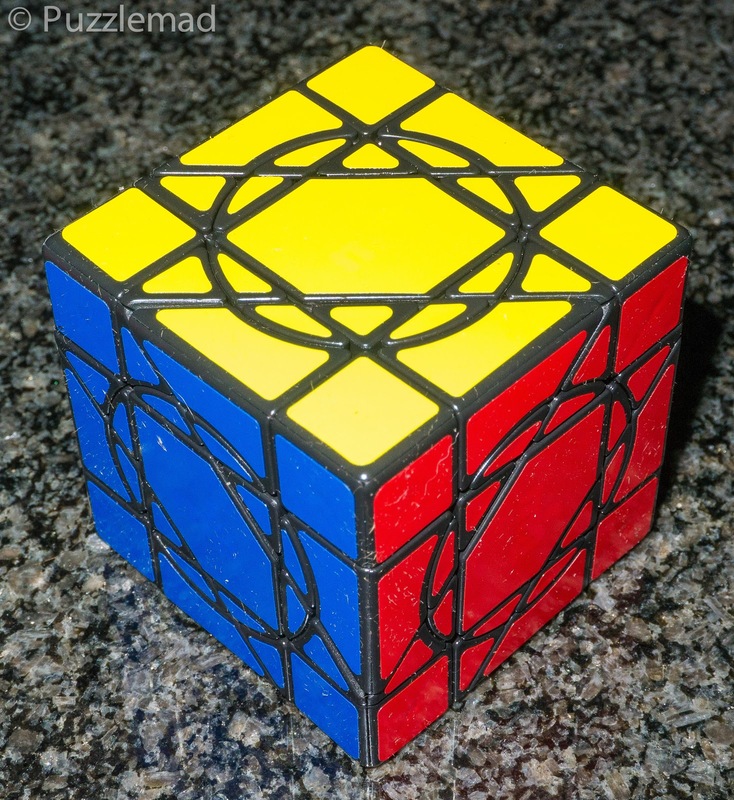 Little tricky to put the cube back together, but not terrible. It was interesting to see your thinking behind your solution.